Implant-ONE HYBRID™ Complete: *For fees please request our comprehensive catalog here: CATALOG REQUEST! Complete pricing includes: Up to four (4) Implant Sites*. Includes: Custom milled TI bar substructure, articulation, analogs, soft tissue model , Implant technical fees and verification jig. 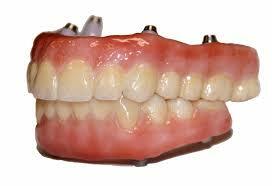 Premium Denture, with Ivoclar Vivadent BlueLine™ teeth and high-impact resin base.